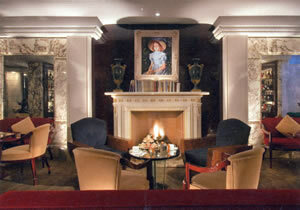 If you like Art Déco, you will love the Hotel Lord Byron. Quietly located in the exclusive Parioli residential district of Rome, near the park of the Villa Borghese, this immaculate 1930s villa houses the collection of its owner, Amedeo Ottaviani. Mr Ottaviani is a gentleman of impeccable taste. 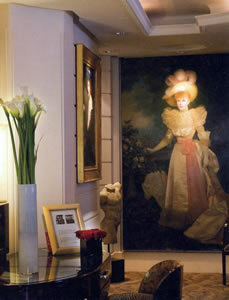 The hotel is therefore full of the most delightful pieces, including important paintings by Maurice Paul Joron and Nicholas Grange Taylor. Mirrored walls reflect images of superb sideboards and chairs and, of course, all the details of the building – the door furniture, the doors themselves, the window frames, and so on – are a joy to behold for anyone with a scintilla of aesthetic sensibility. 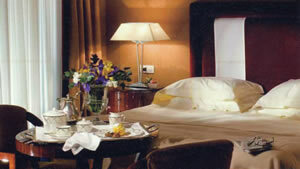 To stay in one of the Lord Byron’s 32 rooms reinforces the sense of Rome as a city of art. 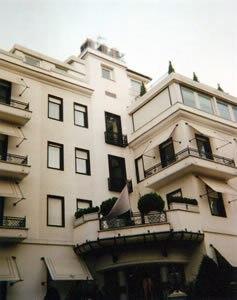 M y billet was on the fourth floor. Room 404 is a ‘Deluxe Double’. 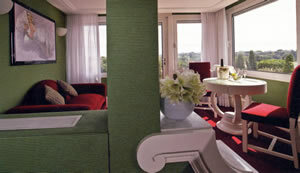 (You will need to look at the hotel website for the prices for specific dates, but think of 400€ and up.) Even before I went in, I was impressed, for the door to the corridor was made of exotic, lacquered wood. Inside was a small hallway with three sliding doors: one to the walk-in wardrobe, one to the bathroom and one to the bedroom. The last was a modestly sized chamber – I thought about 14 feet by 9 feet – with brown damask on the walls and red carpet on the floor. 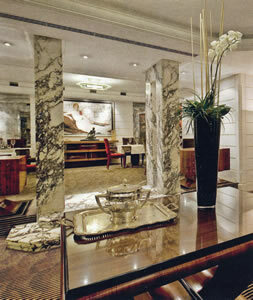 Its most arresting feature was the mirrored corner over the dressing table – in the Art Déco style, naturally. I liked, too, the occasional tables in light wood, with glass windows for seeing the contents of their drawers. With the electrical blind up, I could go through the French window to a small balcony overlooking the neighbourhood. In the bathroom was much grey-veined marble, one wash basin, a loo, a bidet, a decent bath tub with a shower above it, plenty of very large white bath towels and a pair of scales. The toiletries were by Lorenzo Villoresi. At this point I should mention the level of service at the Lord Byron. 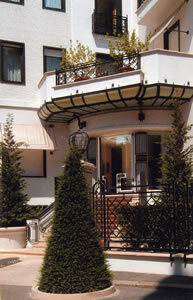 It is high, and reflects well upon the charming resident manageress, Melita Mavrak. I was helped repeatedly by the Second Concierge, Andrea di Sipio, a fellow full of smiles and useful facts. The hotel’s restaurant is called Il Sapori (the tastes) del Lord Byron. 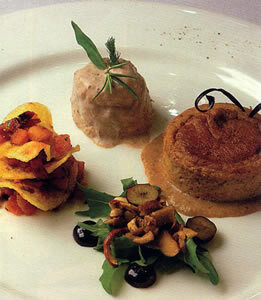 Its Chef is Roberto Antonelli, who uses fine ingredients to create appealing dishes of Italian food. I settled myself in an armchair of blue velvet, next to a fireplace of white marble, and rested my polished brogues on a carpet of black and gold stripes. On my table was a single, fat candle and good glassware by Vega. The lighting was a little bright for me, but the chandelier was quickly turned down at my request, and I settled back for a civilized dinner in a civilized environment. A four course set menu is available for 50€, but I chose to go for four courses from the carte (for which you should allow around 75€). I began with marinated shrimps with an orange and fennel salad – a straightforward dish, with a good balance of tastes and textures. The spelt rigatoncini with red wine and provolone sauce which followed came in a lovely basket made of parmesan. My meat course was easily the highlight of the meal. This chateaubriand, carved by the table, was the finest beef, full of magnificent flavour, and it came, as I had suggested, with onion rings. I love onion rings, don’t you? I ended my dinner with a rich cheesecake with figs – which appeared, to my surprise, in a cocktail glass. The wine list comprises one hundred bottles and nine magnums. Most (apart from the champagnes), as you would expect, are Italian. Prices are quite friendly and run from 25€ for a white from the Trentino to 850€ for a magnum of 1982 Tignanello. Other offerings to catch my eye were: 2009 Planeta chardonnay (60€), 2007 Sassicaia (300€), 2006 Solaia (320€) and Cristal 2004 (300€). I must thank Sommelier Nicola Grieco for recommending a lovely 2007 Chianti Classico Riserva, which possessed a highly perfumed nose and a thrilling depth of ripe damsons (Marchese Antinori). This was exactly the right wine for the beef and was just 55€ - an indication that one does not need to spend a fortune here to drink very well indeed. This dinner was a good meal in elegant surroundings. And my breakfasts were also consumed in a stylish room, on the lower floor of the hotel. Again, there were splendid oil paintings and pieces of fine furniture all around, as I tucked into Corn Flakes, plates of ham and cheese and bowls of fresh fruit salad. If you like your luxury in the manner of Art Déco and you are looking in Rome for a small hotel with a big heart, you will not do better than the Lord Byron. Via Giuseppe de Notaris 5, 00197 Rome, Italy.